The Intertidal Zone area is the interface between the land and the ocean. It is a rocky shoreline (in contrast to mudflats or sandbars) that are defined in relationship to the tidewater levels. 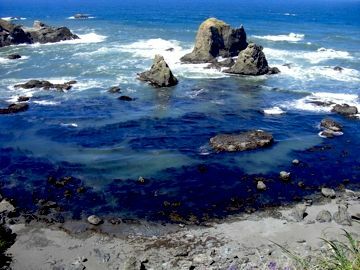 All zonal areas that receive some influence of tidal action, or salt spray by waves, are considered part of the Intertidal Zone. The divisions for an exposed coastline, in feet below or above mean tide, are as follows: Infralittorial Zone (from -5 to -1.5); Infrattorial Fringe (-1.5 to +1); Midlittoral Zone (+1 to +9); Supralittoral Fringe (+9 to +12); Supralittoral Zone (above +12).